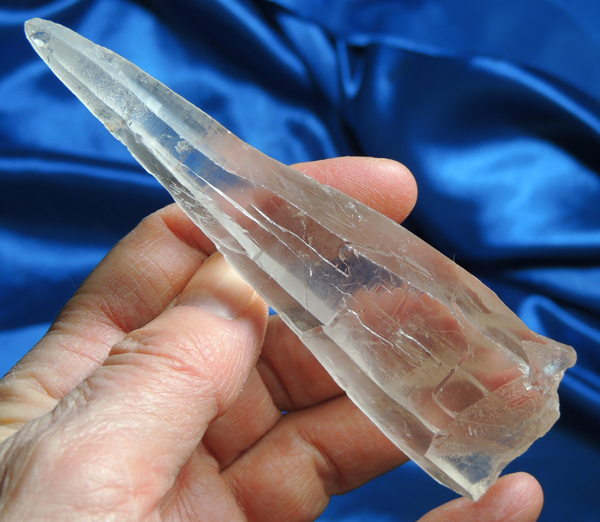 This is a gorgeous 2.7 oz, glowing light pink quartz laser wand from Brazil, 4.5” by 1.2” by 0.95”. There are a number of Pleiadian glyphs and there are deep keys at the base, perfect for thumb and fingers as you work with her. Look at her carefully and you will see a number of little rods of black tourmaline inside her upper portion towards the termination. There is one clearly visible and a number of smaller ones, needle-thin that are best viewed with a loupe. Her base is fully healed and I see one very little ding that you will have to hunt for. She is elegant and warm, stately in her crystalline presence. She is beyond a doubt, a beauty and a wondrous wand!